Just the Facts is a feature that highlights issues and trends in the Judiciary based on data collected by the Judiciary Data and Analysis Office (JDAO) of the Administrative Office of the U.S. Courts. Comments, questions, and suggestions can be sent to the data team. Bankruptcy can provide a fresh financial start for consumers who cannot pay their debts, either because of insolvency or insufficient income to meet creditor demands. Bankruptcy generally works in one of two ways: liquidating assets to pay one’s debts under Chapter 7 of the U.S. Bankruptcy Code, or establishing a repayment plan under Chapter 13 of the code. Under a Chapter 7 liquidation, a debtor generally can achieve a fresh financial start more quickly than under a Chapter 13 repayment plan, which can last up to five years. However, under Chapter 13, a debtor may be able to save a home from foreclosure, reschedule secured debts and extend them over the life of a Chapter 13 plan (possibly lowering the payments), or consolidate debt payments to a trustee who then handles distribution to creditors. In the 12-year span from October 1, 2005 to September 30, 2017, about 12.8 million consumer bankruptcy petitions were filed in the federal courts. Of those, 8.7 million–68 percent–were filed under Chapter 7, and 4.1 million– 32 percent–were filed under Chapter 13 (see Table 1). 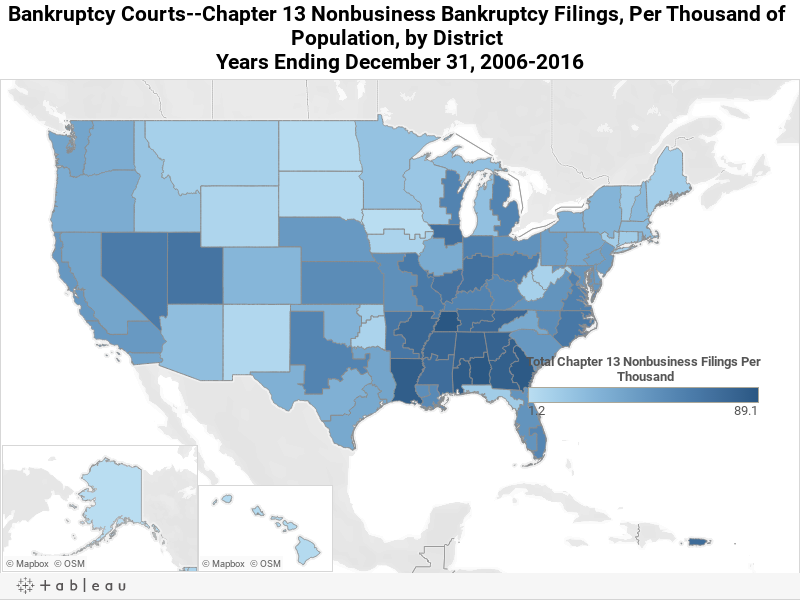 Nonbusiness filings (i.e., filings involving mainly consumer debt) constituted 97 percent of all Chapter 7 bankruptcies and 99 percent of all Chapter 13 bankruptcies. In 2005, Congress enacted the Bankruptcy Abuse Prevention and Consumer Protection Act (BAPCPA), which among other things, instituted a means test for filers to move some away from filing for bankruptcy under Chapter 7 and towards filing under Chapter 13. The goal of the BAPCPA is to have petitioners in Chapter 13 devote disposable income over three to five years to pay unsecured creditors. A person may file for bankruptcy under Chapter 7 only if her or his monthly income over six months prior to filing for bankruptcy is below the state median for a similar household, or if the debtor’s monthly disposable income falls below a threshold established by a statutory means test. Following the last recession (December 2007 to June 2009), overall bankruptcy filings peaked in 2010. Chapter 7 consumer bankruptcy filings have declined since 2010, (see Chart 1) and Chapter 13 filings have leveled off in the last few years (see Chart 2). The percentage of total filings that Chapter 7 filings accounted for has declined since 2010, whereas the percentage of total filings under Chapter 13 filings has increased (see Chart 3). We cannot say with certainty, however, that BAPCPA caused this phenomenon. Table 2 shows the 25 federal judicial districts in which Chapter 13 consumer bankruptcy filings constituted the highest percentage of total consumer bankruptcy filings from 2006 to 2017. Of these districts, 23 (92%) are in southern states. Map 1 also shows that the districts with the highest numbers of Chapter 13 consumer bankruptcies per 1,000 inhabitants were concentrated in the South. In 2016, the five states with the highest rates of Chapter 13 bankruptcy were Alabama (1 in 112 households), Tennessee (1 in 119), Georgia (1 in 135), Louisiana (1 in 179), and Mississippi (1 in 190). The state with the lowest rate was Alaska (1 in 4,359 households). Nationally, there was one Chapter 13 filing for every 405 households in 2016. (see Table 3). Source: Table F-2 for the 12-month periods ending September 30, 2006 Through 2017.